Chief Brent Milhoan became an auxiliary on September 6, 1988. On September 4th, 1990 he became a part time dispatcher continuing his services as an auxiliary officer. On May 19, 1994 Chief Milhoan became a full time dispatcher and remained on as an auxiliary officer. On July 16, 1996 Chief Milhoan became a full time officer and resigned his position as a full time dispatcher. On March 1, 1999, Chief Milhoan was promoted to the rank of sergeant following a promotional examination. On April 30, 2000, Chief Milhoan was promoted to Captain. 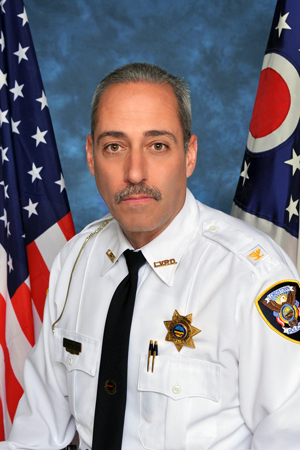 On June 16, 2003, following an assessment test given by the Ohio Chief's of Police Association, Chief Milhoan was promoted to the rank of chief. Chief Milhoan has been a life long resident of Lordstown Village. He and his wife Jodie have two sons, Ben and Austin. Copyright © Lordstown Police Department. All rights reserved.